Imagine you purchase a new soup brand from the grocery store and end up really enjoying it. You tell your friends about this new favorite soup and then go back the next week to buy it again. However, after you try it the second time, you realize that the flavor and the ratio of veggies to broth aren’t the same as the first time. This may sound like a food manufacturer’s worst nightmare, but don’t stress, you can avoid this scenario by implementing physical testing into your food safety and quality monitoring. Physical testing in the food industry refers to the testing methods used to evaluate various physical properties of a food product. Commonly tested properties of food products include the color, viscosity, weight, thickness, granulation size and texture. Physical testing in the application of food primarily acts as an indicator of quality, but it can also be used for ensuring product consistency. Manufacturers can use this to verify product value, correlate a product with consumer perception and, in some cases, ensure food safety when the product must undergo a cooking step. Why is Physical Testing Important? Abnormal physical results may be an indicator of supply chain, production or shelf life issues. Physical testing offers a particular advantage for retailers to monitor their suppliers’ products and get ahead of issues before customers raise complaints. Additionally, when physical properties are tested in conjunction with consumer studies, specification ranges for the physical tests can be correlated with desired product attributes. This can be useful in gauging preferences in appearance, such as a specific color, or texture, such as viscosity, firmness and consistency. The physical properties of a product drive consumer perception and desirability for the product, so establishing ideal physical properties can help in the decision-making process for product developers, marketers and quality controllers. How is Physical Testing Conducted? Quite often, the simplest physical tests are overlooked. Specifically, product weights, volumes and dimensions can be vital to product quality due to labeling regulations and label claims. Consumers and regulatory organizations expect the labeled weight and/or volume to accurately reflect what is in the package. Because of this, the labeled contents can be viewed as a label claim, so the most basic physical tests can carry a lot of weight (no pun intended). Product and case weights also correlate to costs for retailers and further processing facilities. From a business perspective, the purchaser will always want to verify the weight of the product they’re receiving. A product that is consistently below the claimed weight will directly affect the company’s bottom line, so it is beneficial for both the supplier and purchaser to have an unbiased third-party verify a product’s weight. Additionally, weights can be used for determining cook and fry yields for cook validations, quality control programs and claim substantiation. The drained weight test, also called “deglazing,” is primarily applicable to glazed seafood products, but it can also be conducted for other products such as soup, chili, canned fruit, vegetables and proteins. The primary objective for performing a drained weight test on seafood is to determine the percentage of frozen water on the exterior of a seafood product. Verifying this amount ensures that the customer is not paying for excessive water weight. Drained weight for soup-style products determines the weight and/or percentage of solid components in the product, such as meat, beans and vegetables. All drained weight tests employ the use of standard sized sieves for straining, with the appropriate size selected based on product expectations. The importance of the dimensions of a product also cannot be understated, particularly for products that are not ready-to-eat. When a product requires a cooking step, the dimensions dramatically affect the thermodynamics of cooking. For example, if the size of a sausage varies too much, the incorrect dimensions can easily result in undercooking, which is a potential safety issue, or overcooking, which is a potential quality issue. Texture is highly product-dependent. The instrument used for texture testing is highly versatile within the food and cosmetic industries for measuring a wide range of textural attributes, such as hardness, fracturability, compressibility, shear force and springiness. Viscosity is the resistance to flow and it is assessed by measuring the force required to stir a defined rod in the product. Viscosity measures the resistance to flow in soups, beverages, shake mixes and syrup solutions. On the other hand, consistency, a more straightforward test, measures the distance that a sample flows in a predefined time interval. Viscosity and consistency are often used interchangeably. However, the tests are distinguished by the parameters measured, force and distance, respectively. Physical testing is also useful in understanding the particle size/granulation of a product. Varying sizes of sieves are placed on a machine that taps them to facilitate the product falling through the sieve screen. This method provides the calculation of the percentage of product that passes through a particle sieve size, which effectively assesses the size of the particles. Color measurement is conducted using an instrument that measures the degree of lightness/darkness, orange/blue and red/green reflected or transmitted in a sample. Depending on the equipment used at food testing labs, the color may be assessed via reflectance, which means that the wavelengths of light must be able to reflect back to the instrument, or transmittance, which measures how light waves travel through the sample. Where is Physical Testing Conducted? Trust Mérieux NutriSciences as your ‘one-stop shop’ for common microbiology, chemical, physical and sensory testing. Because we provide routine chemistry and microbiology testing, as well as research services, our experts can support concurrent analytical tests and research studies. This is particularly advantageous for the research and development phase of a product or if a client is trying to define the limits for a new product’s specification. If your company is looking to establish the quality shelf life of a product, you can use quantitative physical testing as part of a robust shelf life study and establish if a change in the physical properties of the product may serve as an end of shelf life indicator. Download our sensory services sell sheet to get started today! 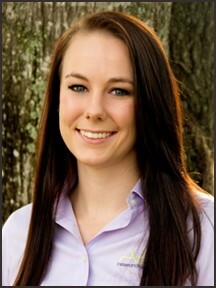 Allison Chandler is the Product Performance Operations Manager for Mérieux NutriSciences located in Gainesville, FL. Allison was promoted to this position in February 2016 after Mérieux NutriSciences’ acquisition of ABC Research. During her career, she has held several positions in the department including Product Performance Technician, Specialist and Assistant Manager. Allison is a graduate of the University of Florida, receiving a Bachelor of Science in Food Science and Human Nutrition in the spring of 2013. She is also working towards her Masters in Food Science at the University of Florida with an emphasis on Sensory Science.Allison currently serves as a Mérieux NutriSciences Culture Ambassador to support and promote a positive work culture and also serves as the Florida Section IFT Secretary. Through her work in the department, Allison has become a Certified Decomposition Analyst for Seafood products under the FDA and specializes in project work ranging from sensory studies to cook validations. In her free time, Allison loves playing with her playful pup, Kawi, whose name comes from Allison’s love of dirt biking on her Kawasaki (aka “kawi”).